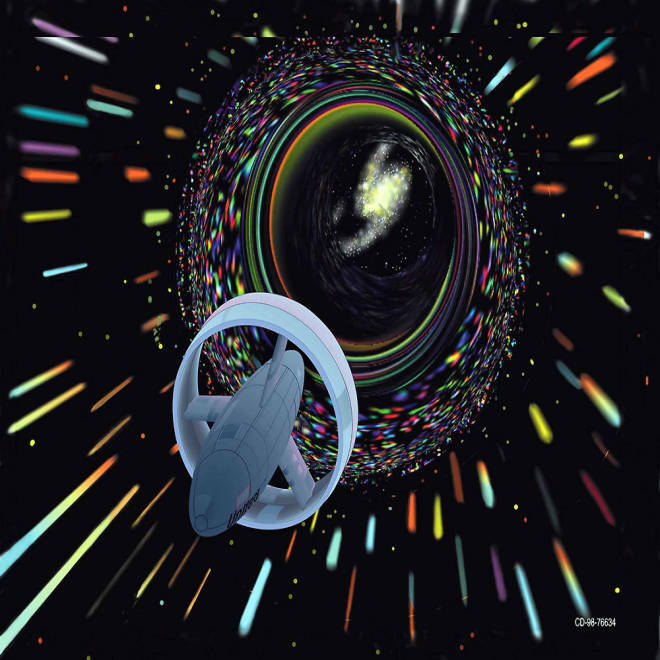 An artist's conception shows a starship entering a wormhole to travel to a distant galaxy. Last month's "100-Year Starship" conference, backed by NASA and the Pentagon's Defense Advanced Research Projects Agency, threw a huge spotlight on the idea of sending spacecraft far beyond our solar system — but how realistic is that idea? Check out what one of the world's top experts on the subject has to say on "Virtually Speaking Science." Marc Millis, the researcher behind NASA's Breakthrough Propulsion Physics Project and the nonprofit Tau Zero Foundation, was my guest on tonight's show, which is available as a podcast via BlogTalkRadio and iTunes. Millis estimates that it'll take 200 years to get in position for the first missions to stars beyond our own, but he says there are lots of small steps we can take starting tomorrow to "chip away" at the challenge. Experiments with solar sails have already started, and Millis says the next step there is to figure out the business case for more ambitious light-powered trips. There are all sorts of potential breakthroughs to consider: Could the recent reports of faster-than-light neutrinos point to a way to break the speed limit set by special relativity? Could laser experiments let scientists warp the fabric of space-time on a small scale? "What creates the properties of an inertial frame, and how does that relate to space travel?" Millis asked. Is it worth spending money on precursor missions — for example, sending a "Super-Hubble" space telescope beyond the edge of our solar system to look outward, and inward? "What would it take to do that? How much would it cost?" Millis said. Cosmic Log: More people are aware that interstellar flight is on the agenda, in part because of the 100-Year Starship conference. So is anyone building a starship anytime soon? What's the next step? Millis: No one's building a starship anytime soon, although a lot of people would like to attempt that. The workshop had about 1,000 people there. It was open to the public, and I was glad to see some very intelligent questions from the public. It was an introductory look at not only the technology, but also some of the social issues, and how you would do financing. The next step by DARPA is that there's a competition out to award the remaining funds of about $500,000 [out of an original $1 million] as seed money to whoever can suggest the best organizational structure to carry forward with the 100-Year Starship image. That will be an organization that will work for at least a century to develop the technology and financing to ultimately enable starships. Q: Do you see Tau Zero as that organization? A: Tau Zero is making a proposal. To gauge our chances, I would have to know what all the other competitors are proposing, and that's hard to do. Q: Could it be that the social issues are actually more challenging than the technological issues? A: Theoretically, it would be possible to send a probe to the nearest neighboring star in less than a century, so you could actually get your data back. But the required expense is beyond what I think our society could commit to right now. Q: What's the ballpark figure for the cost? A: There isn't one, because it's so beyond what we can do. Based on the progression of society ... if we don't change anything that we're doing, it looks as if it might take another two centuries to have an interstellar probe that's fast enough to complete a mission within a human lifespan. Not that there's people on board, but that the people who launched the mission could get the data back before they retire. We have a long way to go. The important issue to figure out today is to make sure we have a sane comparison of the real challenges and the real state of the art, so we're proceeding wisely here. Then, from that, ask, "OK, if that's where we are, what can we start tomorrow to chip away at those issues?" We can't build the starship tomorrow, but we can identify the correct questions to ask, and begin seeking answers to those questions. When it looks more promising, and the advancements are there, fine. On the social issues ... when you think of leaving the planet, and representing Earth, that requires a high degree of political will and collaboration. I don't consider that impossible, and things are certainly looking up in terms of nations collaborating on major space topics. But I don't know how long it will take to really bring this collaboration to bear. Now this doesn't preclude any one sufficiently able and wealthy team from launching their own mission, on their own. Would that be ethical or not? Then, suppose we did identify a habitable planet. Is it really ours to consider colonizing? There are a lot of huge questions: What's the optimal population for an interstellar trip? What are the governance models? What's the meaning of life? When you start thinking about "world ships," where we're sending people instead of just robotic probes, that provides a venue that's far enough out that you can rationally discuss these questions. It's an interesting opportunity that we really haven't tapped into yet. Q: I guess one of those big questions would be, "Why travel to other star systems?" How would you answer that one? A: The ultimate, highest-priority benefit of star flight is the survival of the human species beyond the fate of our own solar system and our home planet. In the meantime, the progress we make to try to turn all this stuff into a reality will result in profound improvements in energy conversion, transportation, self-supporting life support — things that would be very useful for life on Earth. And then there's the social aspect. This effort can give us hope for a better future, expand our opportunities — and hopefully give people a frontier to conquer, rather than being left with no option other than to conquer each other. Last update: 10:30 p.m. ET Nov. 2. Many thanks to the Meta Institute for Computational Astrophysics for co-sponsoring tonight's Second Life talk at the Stella Nova auditorium. Connect with the Cosmic Log community by "liking" the log's Facebook page, following @b0yle on Twitter or adding me to your Google+ circle. You can also check out "The Case for Pluto," my book about the controversial dwarf planet and the search for other worlds.